Have you ever experienced the feeling that you are playing the same guitar phrases and ideas over and over again? In order to keep your listeners interested, you want to be able to extend your possibilities and get the most out of the few notes of the pentatonic scale. String bending is a technique that can greatly extend your guitar soloing skills while at the same time create many emotions in your solos. However, not all notes in the pentatonic scale can be bent successfully. In this article, we will look at how to effectively apply different sized string bends within the pentatonic scale, which is a very important aspect of becoming a guitarist that can create an emotional impact in his/her audience. Each of these notes gives another feel when played as a string bend. The target note (which is the note we are bending to) might not be strictly a note from the pentatonic scale you are playing, but can also be a note from another scale. In the second part of this article we’ll look at less common notes to perform string bends on, but first let’s cover the basics. Let’s start with the three most common string bends in blues and rock guitar playing. The first one starts off from the B-string on the 8th fret. Our starting note here is the G note, and the target note is the A (the root note of our scale). So we have to bend the string over an interval of 2 frets. This is a standard rock/blues bending commonly used by all players in all styles of guitar playing. In the scale diagram below you will see the target notes in red, so you can clearly see that for this first important string bend we are targeting the A note on the B string. The second most commonly used string bend uses the D note on the G string (7th fret) as starting note to bend to the E note with again an interval of 2 frets. This one is also a very common blues/rock bend. If we however bend the starting note only over an interval of one fret, we will create a ‘bluesy’ feel, because our target note is the blue note of the pentatonic blues scale, which is the Eb note in this case. This bend will give a lot of color to your soloing! 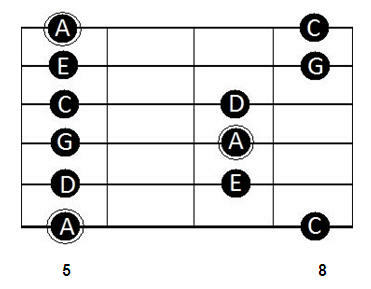 The final most common bend inside the pentatonic scale is to bend the C note on the high e string 8th fret to the D note, over again an interval of 2 frets. This one can be a bit tricky, because the high e string has to be bent with a pretty high force to reach the D note. Look at the following list below. As you can see each string bend has a distinct feel that comes with it. Let’s look at some examples to investigate further in these basic string bends. The first example is a common, well-known blues/rock lick that is widely used. The full bend of the D on the G-string reaches the E note. When the D note is only bent a half step, it reaches the D# note of the pentatonic blues scale, thus it creates a completely different feel. 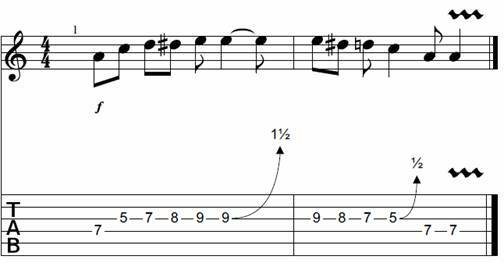 This lick combines 2 common bendings in the pentatonic scale. The lick is ended with a bend vibrato on the root note of the scale. Now that you’re familiar with the most common string bends in blues and rock guitar playing, try to recognize them in your favorite guitar solos. When you’re listening to blues or rock guitar solos, listen carefully if you hear a bending. Do some of them sound familiar to you? If they do, try to emulate them! Otherwise, if they sound different than the ones we’ve already covered, it might be a bending you’ll find in the second part of this article! Most of the bends you hear in rock and blues music are the standard ones that bend over an interval of 2 or 1 fret(s) to another note in the scale, but a solo can sound a lot more complex and colored if bends are used that have a larger interval, or are bent to notes that are not strictly part of the minor pentatonic scale. It is certainly worth it to experiment with the sound of the different bendings. Some of them may sound weird at first, but try to play them in a phrase with other notes of the pentatonic scale. The notes that precede or are played directly after the bend can also contribute to the sound and emotion of the bending. In the scale diagram below you’ll find many more target notes we can bend to. Some notes in the scale can be bent over a one-fret distance to reach a note that’s part of the major pentatonic scale. This gives a nice bluesy sound with a lot of color. The C note for instance on the G string (5th fret) can be bent with the index finger to a C# note. This note is the major 3th of the A scale, which gives a ‘happy’ sound. This same bending can be done on the high E string (8th fret). We can bend this one with our pinky or ring finger. I talk about adding this note to your blues guitar solos in my free Guitar Solo Tips Guide which explains the basics behind playing advanced blues solos. We can also start from an outside note and bend to a note within the scale. 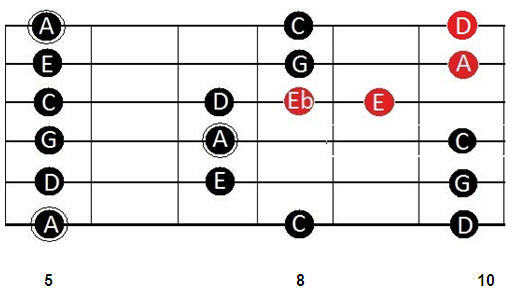 On the high E string for example we can play the C note on the 8th fret, but we can add a nice feel to a note if we do a 1-fret interval bending from the B note 7th fret to the C note, this one also gives a major feeling. Also, try bending from the F# note on the B string to the G note for some added color in your solo. To get the most out of bending, you might want to try to bend over a larger interval than 2 frets. This technique however requires a bit more practicing, since it is harder to exactly reach the right note over a larger interval than over a short one. Be sure to practice the “big bends” with a guitar tuner! There are a few common long distance bends that work great, but not all of them. A first common one is to bend the E note on the 9th fret of the G string to the G note 3 frets further. This bend will get you in the 3th position of the pentatonic scale! This bend works great if you do a bend and release followed by a descending run using the Eb blues note. In the following lick a big bend is followed by a 1-fret distance bend to the C# major note of the scale. Other notes that can be bent over a larger distance are the root notes, They can be bent to the 9th over a 2-fret distance followed by a 3-fret distance bend to the C note. The note can be even bent a half step further to the C# major note, that’s a total interval of 4 frets! Look at the list below and try out a few of these longer distance string bends for yourself. Listen for the feel that these bends give you when played in the context of a blues guitar solo. Certainly don’t be afraid to try other bendings, but always be sure to figure out what note you’re bending to and carefully listen to the emotion that the bending evokes in order to effectively impact your audience when playing solos. Learn the best guitar technique in order to make your guitar sound like it's crying by learning how to make your guitar cry.